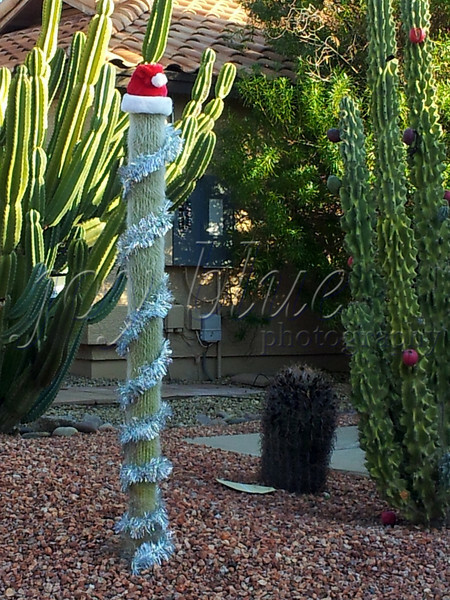 Day 50—21 December 2011 Christmas decorating, Southwest style It never fails to crack me up—Santas, snowmen, reindeer, and the like adorn the desert lawns. We passed one house that would have put Chevy Chase’s Clark Griswold to shame. People double-parked on a small frontage lane (including a Hummer stretch limo) to see the carnival in one front yard. Anyway, I thought this one (on my daily walk route) was particularly cute. Don’t miss the ball ornaments on the cactus at right.